I first discovered the Philosophy brand in college completely by accident. I was unhappy with my drugstore facial cleanser and had gone to an even at Nordstrom with a friend. My friend raved about the brand so I decided to splurge and give it a try. I fell in love with the purity cleanser. It’s absolutely amazing! Over the years of trying different medications for my arthritis my skin became very dry and somewhat sensitive. My skin isn’t completely sensitive but I do react to a lot of products. I’m not completely sure if the medications actually had any affected on the change in my skin but hormones and purity, along side up to 30 pills a day, I believe they played some roll in the change. Now as an adult, my skin has stabilized for the most part. I’ve found a routine that works and keeps my face relatively clear, with only the occasional breakout or texture on my face. The one thing I had been on the hunt for was a nighttime hydrating moisturizer. A few weeks back I was on the Philosophy website purchasing my daily moisturizer and had a free gift with a $60 purchase. The free gift was a 2oz Back to Nurture Replenishment Crème. I did a little research and decided to spend an extra $15 to get the free moisturizer. I’ve been trying this product out for about two weeks and I love it! It marketed to be a daily morning and night moisturizer but I find that’s too thick for me to wear under makeup so I use it strictly as a night cream. It’s a very thick consistency but is easy to blend in all over the face and neck. The next morning my skin is supple, smooth and hydrated. The only downside for me is the scent. All Philosophy products have a slight scent and this one is not different. It has a perfume scent to it which doesn’t linger for more than about 5-10 minutes but I could do without the scent completely. 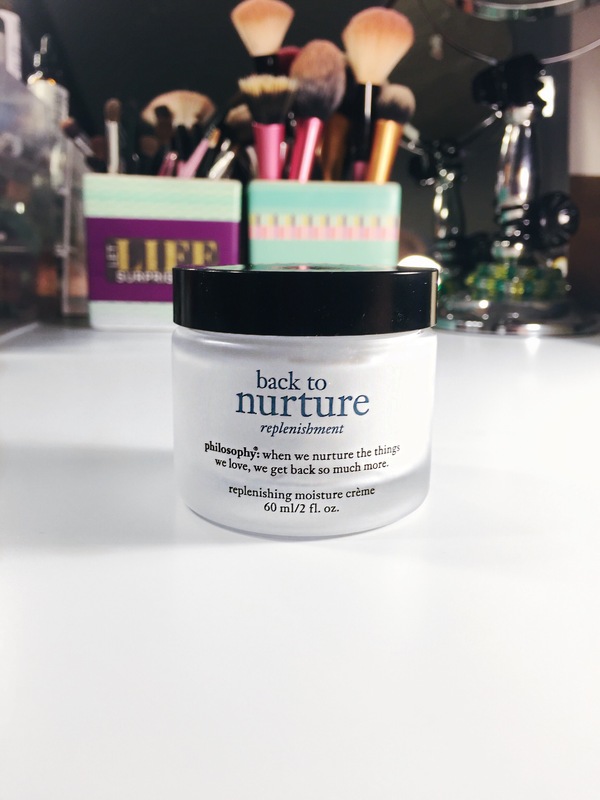 If you struggle with finding products that work, I highly recommend the Philosophy brand to everyone I know! I even got my older sister who is even more picky than I am, to try the face cleanser and moisturizer and she loves them! One of my favorite things about Philosophy is, if you sign up for their promotional emails on their website, they’re always having really amazing free gift with purchase giveaways. It’s a great way to purchase one or two products and get another for free! And let’s be honest, who doesn’t love a free gift?! Let me know in the comments how you deal with changes in your skin and what products work for you. Have a wonderful weekend! This entry was posted in Beauty, Review and tagged beauty, makeup, moisturizer, philosophy, Review, skincare. Bookmark the permalink.